Coal mining was once the ticket to wealth in rural West Virginia. Today it is a struggling industry—the number of coal jobs in the state has halved since 1983. 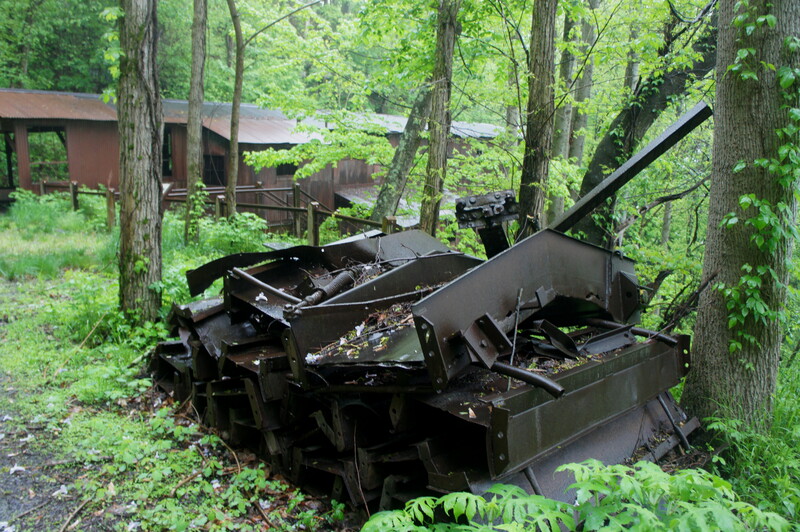 Yet even as more coal mines close, they remain an integral part of West Virginia’s heritage, and a number of sites are protected by organizations like the National Park Service to help remember and safeguard the industry’s legacy. New River Gorge National River in south central West Virginia preserves a handful of old mines and mining towns, including the once-thriving operation at Nuttallburg, owned for a time by famed Detroit industrialist Henry Ford. Today it is possible to explore the abandoned town, once home to hundreds of employees, or to hike down from the canyon rim to the mine and “headhouse”—where coal cars were loaded onto a steep conveyor for delivery down to the railroad. 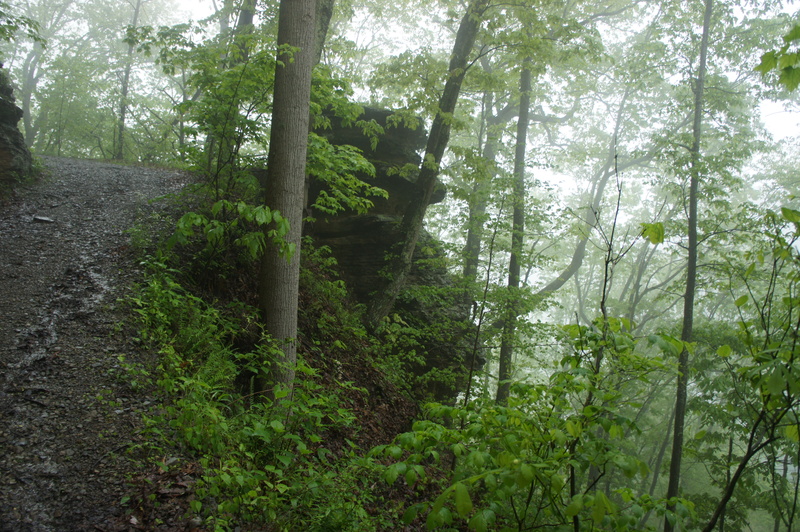 The Headhouse Trail, situated about ¼ mile off the Lansing-Edmond Road in New River Gorge’s north district, offers access to the mine without having to drive the rocky and winding Kenney Creek Road down to the town—a road that can be difficult to manage in wet weather. Hearty hikers can follow the Headhouse Trail to its end, then continue down the Conveyor Trail to the town itself, though this option is not for the faint of heart—it covers more than 1,000 feet in elevation loss/gain in under two miles. 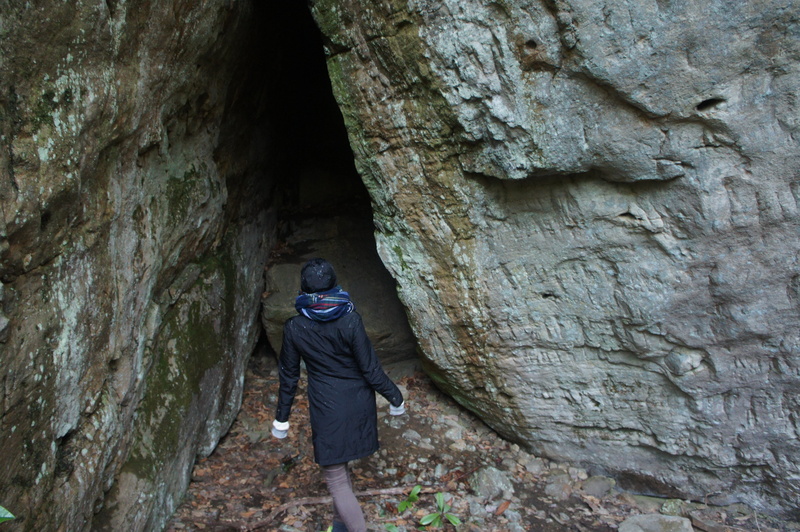 For others, the headhouse and mine entrance are a worthy destination, while rock forms of unusual size and shape keep hikers’ interest on the 7/10-mile hike down to the mine site. Reaching the trailhead can be a little tricky, so make sure to grab from the nearby Canyon Rim Visitor Center the official trail guide (a 20-page newsletter), which provides maps and directions. In short, from Fayetteville or the Visitor Center, follow the narrow but paved Lansing-Edmond Road east for 2.5 miles, passing the dual entrances for the more-visited Endless Wall Trail on the right. Turn right on the curiously-named Beauty Mountain Road and continue for 1/10 mile, passing an open field and cemetery on the right. Just as the main drive bears east into the woods, look for an unpaved track leading slightly uphill on the right. This is your route—follow the partly-graveled track through dense tree cover to a small parking area at the end. There should be a house on your right—and the signed start to the Headhouse Trail on the left. The Headhouse Trail follows an old administrative road that is several feet wide and gradually works its way down into the canyon. A few minutes in, look for a series of small caves—or, rather, dark crevices in the Nuttall sandstone—on the right, guarded by stands of rhododendron. 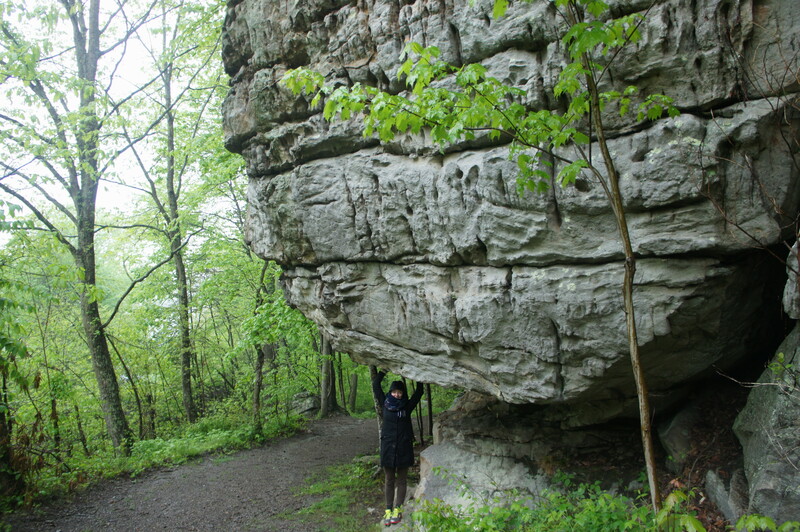 The geological features of the hike are an added bonus, and they serve as a reminder of the ancient geological history of the New River Gorge, the origins of which date back more than 300 million years. Scientists believe that New River is the only remaining remnant of the ancient and mighty Teays River, which flowed from present-day West Virginia to the Mississippi. Continuing downhill from the caves, the Headhouse Trail gradually bears westward, passing a number of memorable rock formations of colossal size, including a rounded and striated chunk of limestone that juts out over the trail, a ship-sized boulder that reaches a sharp point some 20 feet above the path, and a two-tiered, mushroom-shaped monolith perched above a vertical drop on the left. From here it is a short walk downhill to the headhouse and mine entrance, two of several notable structures in the area. The first building on the left was the electric substation, which converted alternating current to direct current and reduced voltage. The next building on the left, just before the mine entrance, was the hoist house, where miners kept machinery for hauling coal. Then, of course, there was the mine itself—a so-called “drift” mine, meaning the entrance was at the same level as the coal. 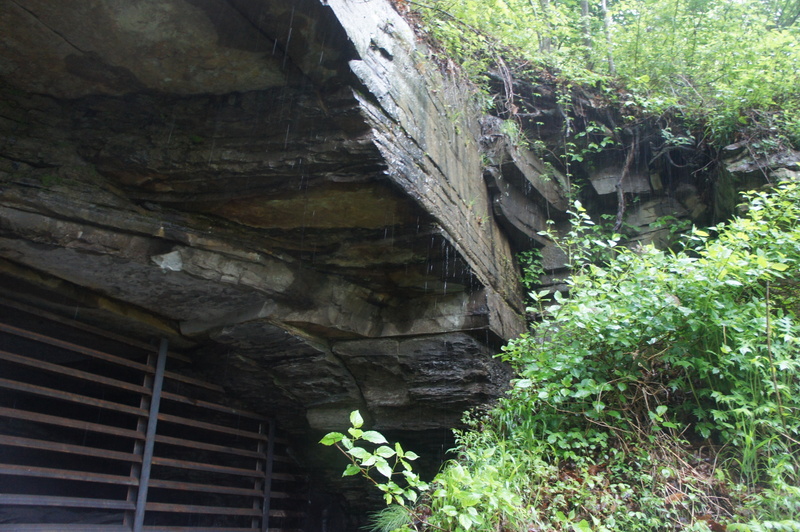 Here the Sewell Coal Seam is a mere 3.5 feet thick but offered coal that was deemed high-quality, thus keeping the Nuttallburg mine in business from 1873-1958. Today the cave has been shut but remains home to several species of bats. 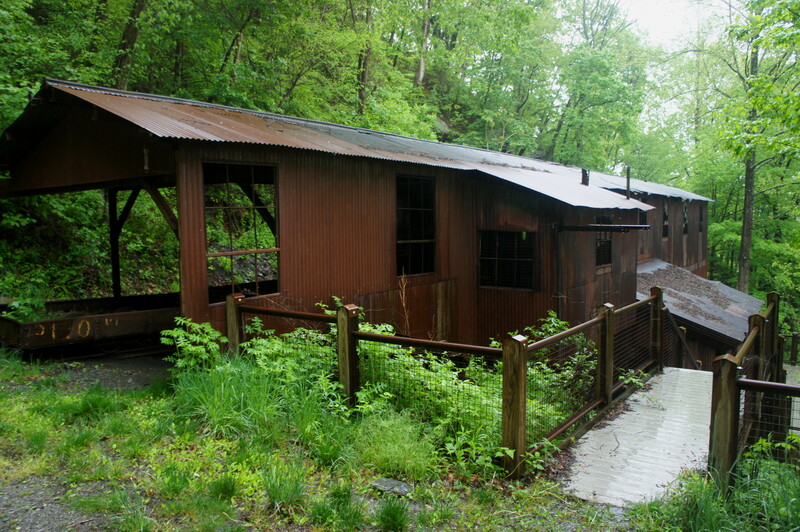 Opposite the mine entrance lies the headhouse, where coal cars were weighed and inspected for delivery down the lengthy conveyor, which descends more than 600 feet at a steep pitch to the town on the banks of the New River. In the 1920s, when the present conveyor was built, it was cutting-edge technology, greatly enhancing the mine operators’ ability to transport the coal intact. 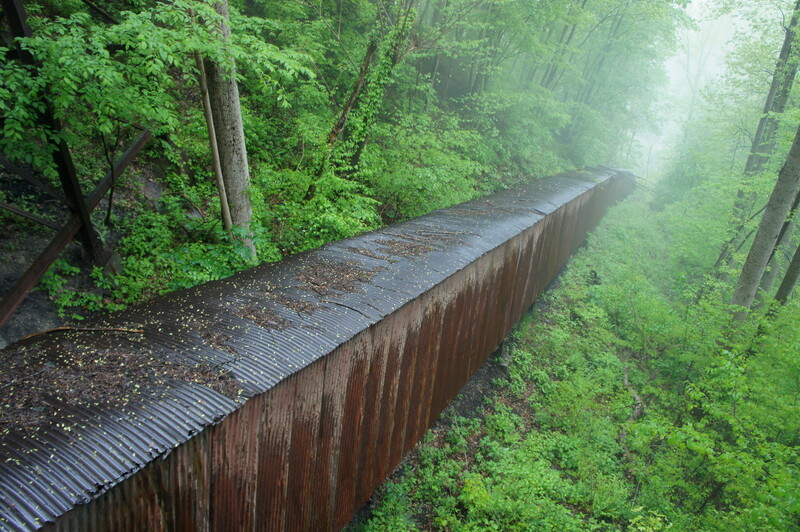 The headhouse sits about 2/3 of the way up the north slopes of New River Gorge, and as noted before, it is possible to follow the Conveyor Trail the rest of the way down to the town of Nuttallburg. But for those short on time and energy, return back the way you came—yes, 400 feet in elevation gain is tougher when heading uphill!—to the canyon rim and the Headhouse Trailhead. 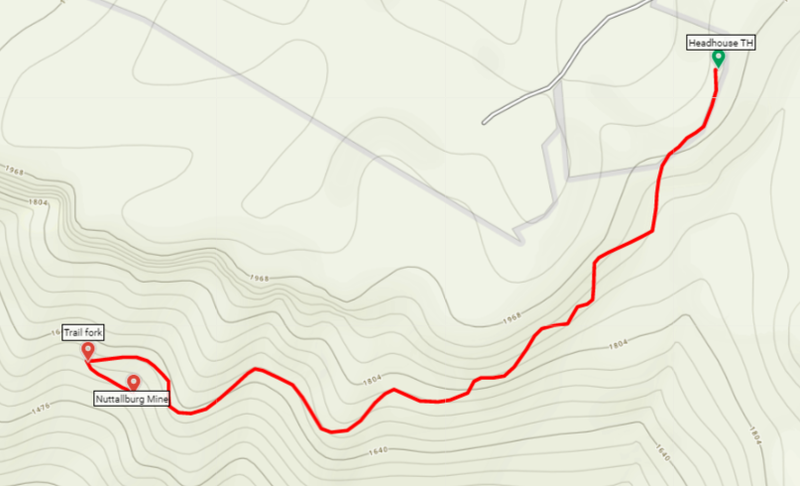 Allot around 1-2 hours for this out-and-back hike, including time spent exploring the headhouse area. Lifting up a giant chunk of weathered limestone! 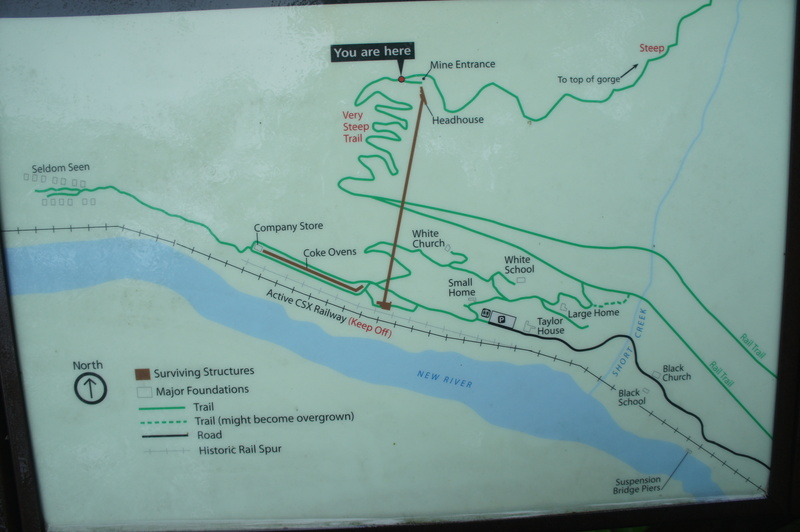 This entry was posted in Moderate Hikes, New River Gorge National River, West Virginia and tagged coal, headhouse, Headhouse Trail, historic, mine, New River Gorge, Nuttallburg, Nuttallburg mine, West Virginia. Bookmark the permalink.